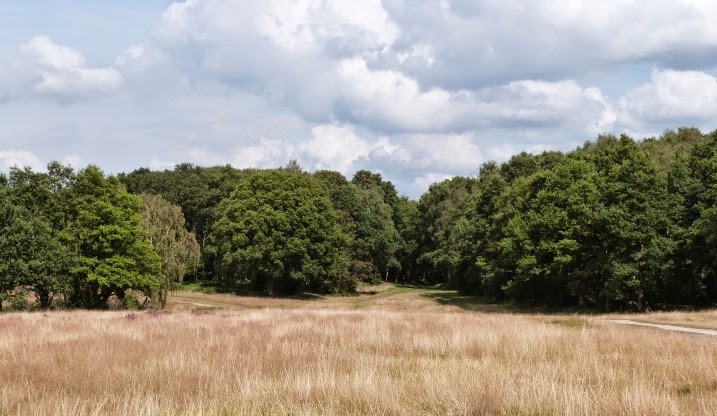 This is a circular route of about 2 ½ miles through the beautiful countryside and woods that make up Chorleywood Common. On leaving the station go over the road with caution to reach a public footpath which starts off as a steep gravel slope. Follow this round in a housing development until Common Road. 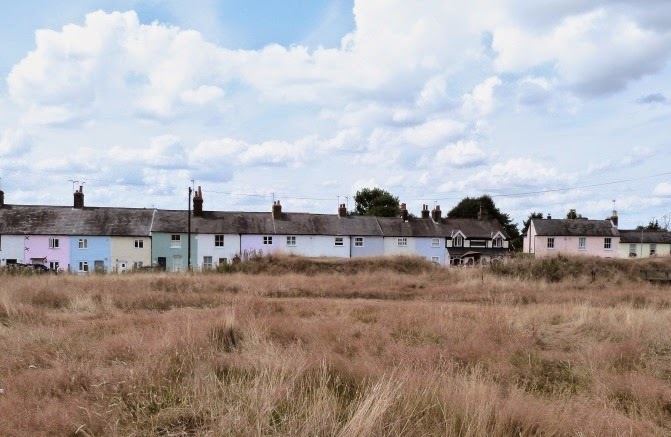 To the left is a line of small houses painted in different pastel shades so they resemble blocks of ice cream - a useful marker should you get lost, as they are visible right across the common. In the golf club car park on the opposite side of the road is an information board with map which you might find useful. Walk to the right of the car park for a horse track. Follow this round as it skirts the woods. The upper path is the one you want, but soon you will be going downhill. At the T junction with a road there is a sign 'Horse Track entrance'. Here you should keep on round to the left up a narrow way with a stunning panorama to the right. Soon the trail narrows further and is lined with bracken. After about ten minutes you will get to some houses and a car park. 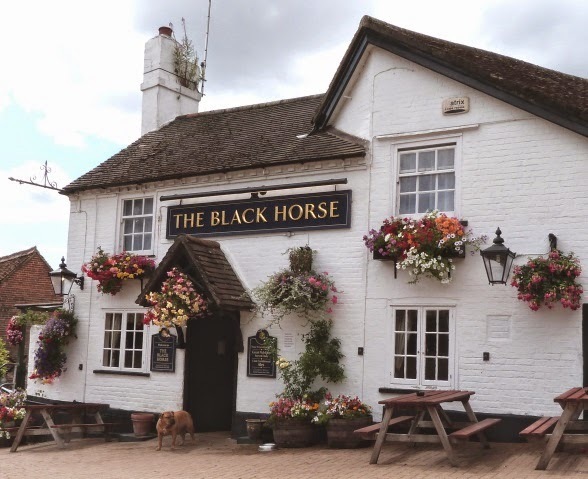 Go past these to find The Black Horse pub. 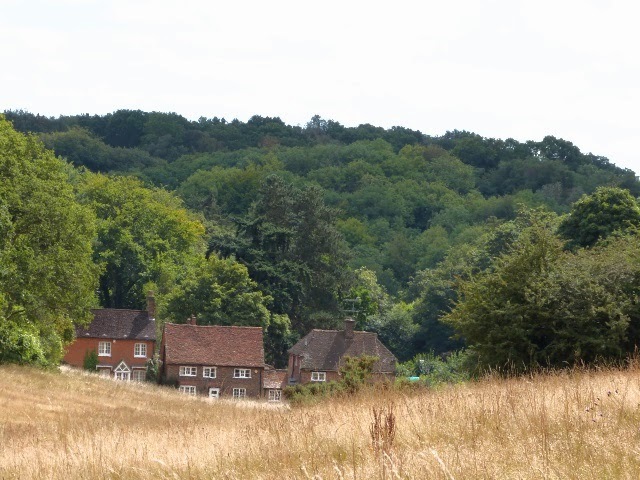 Beyond it to the right there's a lovely view of cottages snugly tucked away in the valley. Return to the horse track by taking a shortcut upwards across the grass on the right. At the top turn right and potter along by the side of the woods. Dog Kennel Lane is below, with a scattering of attractive old dwellings. Continue as the route bends into the woods (opposite a black weather-boarded house). At a cricket ground the main track goes ahead, but you should bear right up a grassy slope to reach a flint-faced Victorian primary school (modernised). Just beyond that is Christ Church. This building, also faced with flint, was originally built in 1845, but became inadequate for the increased congregation. In 1870 it was demolished, except for the base of the tower. 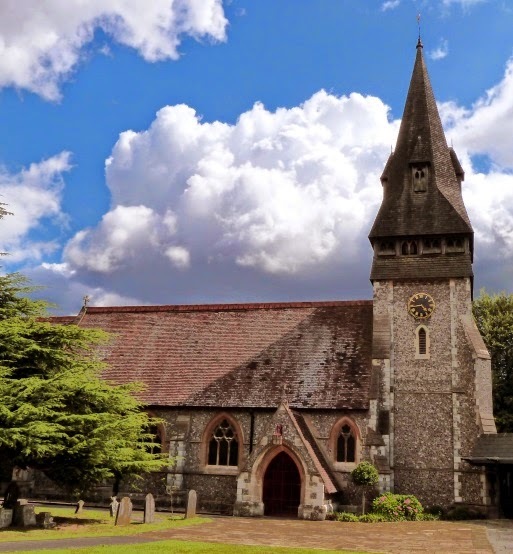 The new church was designed by the architect of the Royal Courts of Justice in the Strand, George Street, and has a delightful cedarwood shingle spire. (I suggest not wandering between the graves, as the ground is extremely uneven, especially at the back of the church.) Take the surfaced way in the churchyard to the Rickmansworth Road and look across to the house opposite where there is an impressive hedge. Now comes the difficult bit - getting over the road. (I don't understand the lack of a crossing of any kind along this stretch, as there's a lot of traffic.) Please be cautious. 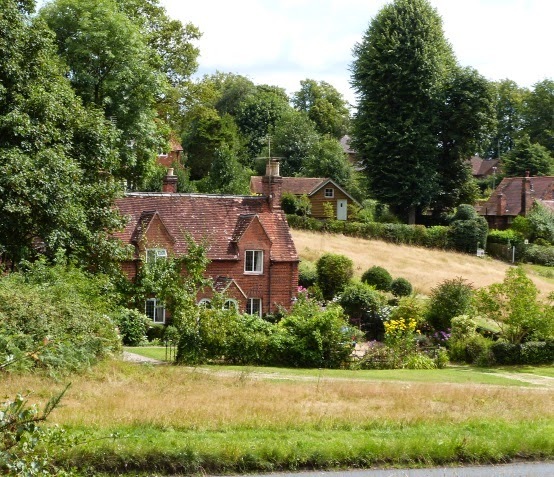 Once safely across, turn left to reach the Chorleywood House Estate. Go in through the gates and follow the tarmac road towards woodland. Behind the tennis courts on the left is Chorleywood House which is private, but you can walk over the mown grass to see the gardens. 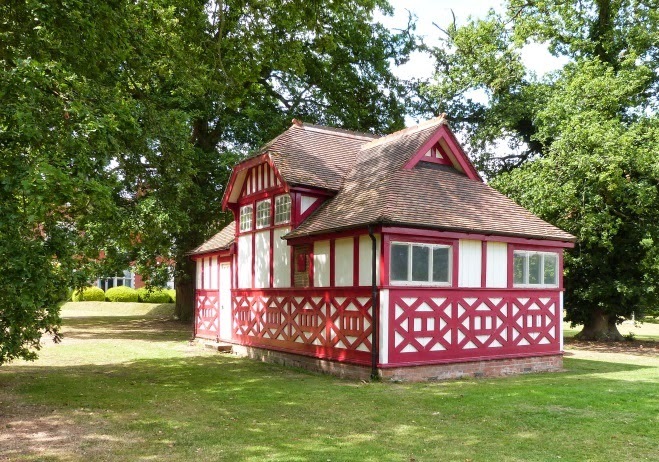 Look out for the fun red and white summer house/sports pavillion. Return to the road and continue towards Dell Woods and Nature Reserve - a splendid place for a picnic. In the summer months cattle may be grazing as part of a conservation plan, but there are notices with information as to what fields the animals are in, so you can avoid disturbing each other. Full details on the Chorley Common link above. To get back to the Tube station, retrace your steps to Rickmansworth Road, and pass through the car park by the cricket ground opposite to pick up a track to the right. This runs parallel to the main road. Access: Unsuitable for buggies or wheelchairs. Both the public footpath and Colleyland lane are steep enough to cause problems for anyone with walking difficulties. This is just one route from the many to be found at London Tube Rambles. There are architectural gems, beautiful country views, historic places and quirky buildings to be found in the area covered by the outer London Underground stations. Usually the discoveries are within a mile of the Tube - often only five minutes walk away. If you reached this as an individual page via a search engine, you might like to click on the link above and see the other destinations explored. You'll be amazed at what's out there!